My previous post discussed compression in the 7000 series. 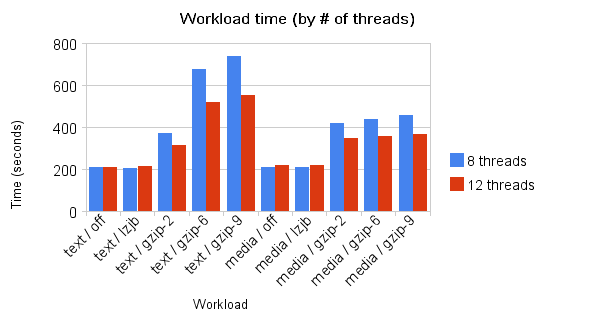 I presented some Analytics data showing the effects of compression on a simple workload, but I observed something unexpected: the system never used more than 50% CPU doing the workloads, even when the workload was CPU-bound. This caused the CPU-intensive runs to take a fair bit longer than expected. Note that in order to run this experiment, I had to modify the system in a very unsupported (and unsupportable) way. Thus, the above results do not represent current performance of the 7410, but only suggest what’s possible with future software updates. For these kinds of ZFS tunables (as well as those in other components of Solaris, like the networking stack), we’ll continue to work with the Solaris teams to find optimal values, exposing configurables to the administrator through our web interface when necessary. Expect future software updates for the 7000 series to include tunable changes to improve performance. Finally, it’s also important to realize that if you run into this limit, you’ve got 8 cores (or 12, in this case) running compression full-tilt and your workload is CPU-bound. Frankly, you’re using more CPU for compression than many enterprise storage servers even have today, and it may very well be the right tradeoff if your environment values disk space over absolute performance. Update Mar 27, 2009: Updated charts to start at zero. Built-in filesystem compression has been part of ZFS since day one, but is only now gaining some enterprise storage spotlight. 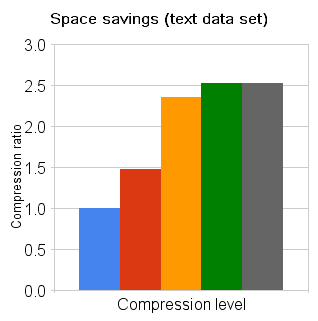 Compression reduces the disk space needed to store data, not only increasing effective capacity but often improving performance as well (since fewer bytes means less I/O). Beyond that, having compression built into the filesystem (as opposed to using an external appliance between your storage and your clients to do compression, for example) simplifies the management of an already complicated storage architecture. Your mail client might use WinZIP to compress attachments before sending them, or you might unzip tarballs in order to open the documents inside. In these cases, you (or your program) must explicitly invoke a separate program to compress and uncompress the data before actually using it. This works fine in these limited cases, but isn’t a very general solution. You couldn’t easily store your entire operating system compressed on disk, for example. With ZFS, compression is built directly into the I/O pipeline. 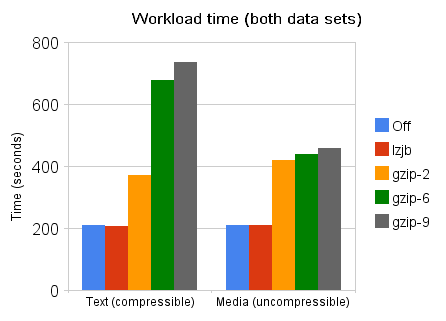 When compression is enabled on a dataset (filesystem or LUN), data is compressed just before being sent to the spindles and decompressed as it’s read back. Since this happens in the kernel, it’s completely transparent to userland applications, which need not be modified at all. Besides the initial configuration (which we’ll see in a moment is rather trivial), users need not do anything to take advantage of the space savings offered by compression. After that, all new data written to the share will be compressed with the specified algorithm. Turning compression off is just as easy: just select ‘Off’ from the same drop-down. In both cases, extant data will remain as-is – the system won’t go rewrite everything that already existed on the share. Note that when compression is enabled, all data written to the share is compressed, no matter where it comes from: NFS, CIFS, HTTP, and FTP clients all reap the benefits. In fact, we use compression under the hood for some of the system data (analytics data, for example), since the performance impact is negligible (as we will see below) and the space savings can be significant. You can observe the compression ratio for a share in the sidebar on the share properties screen. This is the ratio of uncompressed data size to actual (compressed) disk space used and tells you exactly how much space you’re saving. People are often concerned about the CPU overhead associated with compression, but the actual cost is difficult to calculate. On the one hand, compression does trade CPU utilization for disk space savings. And up to a point, if you’re willing to trade more CPU time, you can get more space savings. But by reducing the space used, you end up doing less disk I/O, which can improve overall performance if your workload is bandwidth-limited. But even when reduced I/O doesn’t improve overall performance (because bandwidth isn’t the bottleneck), it’s important to keep in mind that the 7410 has a great deal of CPU horsepower (up to 4 quad-core 2GHz Opterons), making the "luxury" of compression very affordable. The only way to really know the impact of compression on your disk utilization and system performance is to run your workload with different levels of compression and observe the results. Analytics is the perfect vehicle for this: we can observe CPU utilization and I/O bytes per second over time on shares configured with different compression algorithms. These results do not demonstrate maximum performance. 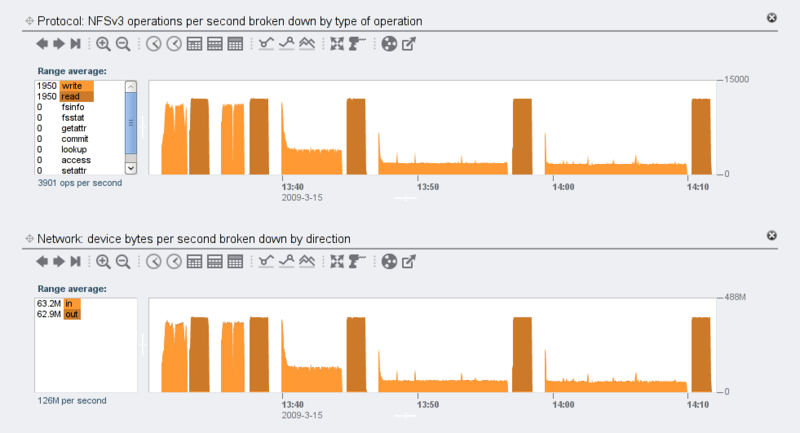 I intended to show the effects of compression, not the maximum throughput of our box. Brendan’s already got that covered. The server is a quad-core 7410 with 1 JBOD (configured with mirrored storage) and 16GB of RAM. No SSD. The client machine is a quad-core 7410 with 128GB of DRAM. The basic workload consists of 10 clients, each writing 3GB to its own share and then reading it back for a total of 30GB in each direction. This fits entirely in the client’s DRAM, but it’s about twice the size of the server’s total memory. While each client has its own share, they all use the same compression level for each run, so only one level is tested at a time. The experiment is run for each of the compression levels supported on the 7000 series: lzjb, gzip-2, gzip (which is gzip-6), gzip-9, and none. The experiment uses two data sets: ‘text’ (copies of /usr/dict/words, which is fairly compressible) and ‘media’ (copies of the Fishworks code swarm video, which is not very compressible). I saw similar results with between 3 and 30 clients (with the same total write/read throughput, so they were each handling more data). I saw similar results whether each client had its own share or not. sion. Anyway, since it only uses 50% of CPU, the more expensive compression runs end up taking longer. We expect to see an actual decrease in disk bytes written and read as the compression level increases because we’re writing and reading more compressed data. lzjb can afford decent space savings, but performs well whether or not it’s able to generate much savings. Even modest gzip imposes a noticeable performance hit, whether or not it reduces I/O load. gzip-9 in particular can spend a lot of extra time for marginal gain. Moreover, the 7410 has plenty of CPU headroom to spare, even with high compression. We’ve seen that compression is free, built-in, and very easy to enable on the 7000 series. 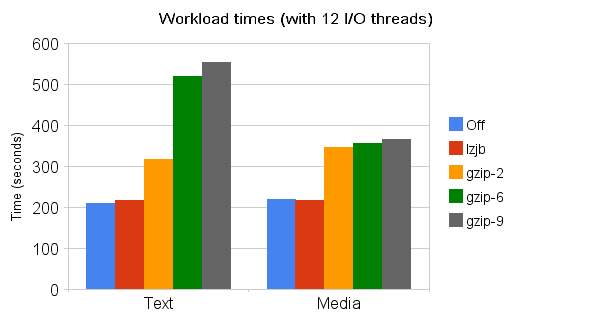 The performance effects vary based on the workload and compression algorithm, but powerful CPUs allow compression to be used even on top of serious loads. Moreover, the appliance provides great visibility into overall system performance and effectiveness of compression, allowing administrators to see whether compression is helping or hurting their workload.